VP of Research and Development, Clontech Laboratories Inc.
Clontech’s In-Fusion cloning is a remarkably versatile method for creating seamless gene fusions. SnapGene was the first software to simulate this procedure. For the In-Fusion reaction, a linearized vector is mixed with one or more PCR products that have overlapping ends. 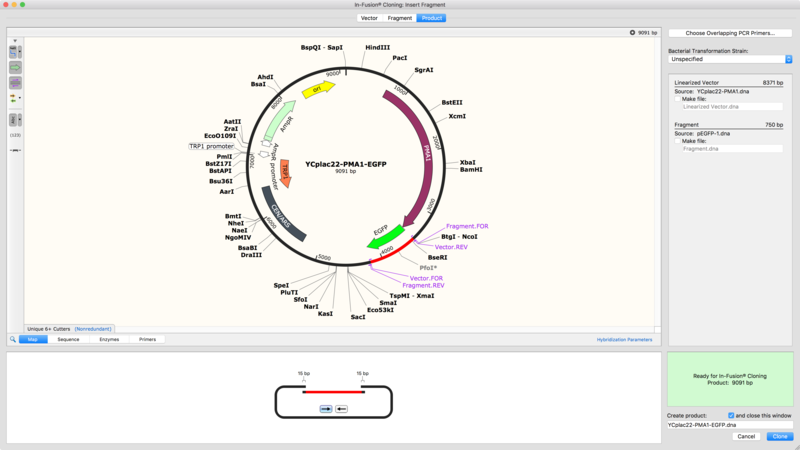 SnapGene simplifies In-Fusion cloning by automating the primer design. To plan an In-Fusion reaction, just select the DNA fragments that you wish to fuse, and SnapGene will choose suitable primers. Please click below to see a screenshot, a brief tutorial video, and In-Fusion-ready vectors from Clontech.